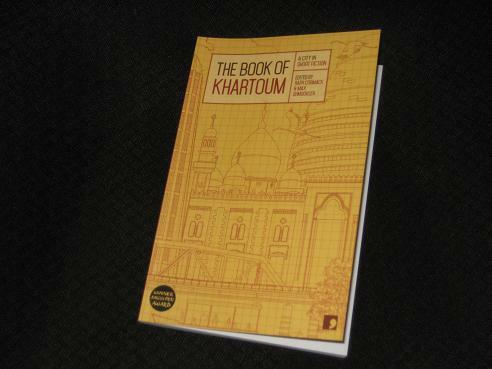 The Book of Khartoum (edited by Raph Cormack and Max Shmookler, review copy courtesy of the publisher) is the latest in Comma Press’ series of city guide short-story anthologies, bringing together ten stories from contemporary Sudanese writers which are set, or deal with, the country’s capital city. It has to be said that it’s a fairly short collection, with many of the stories only running to a few pages, but it makes up for that in terms of quality as I couldn’t really find a bad one among them. Most of the stories are set in the present, or the fairly recent past, but the final piece, Hammour Ziada’s ‘The Void’ (translated by Kareem James Abu-Zeid) is a lengthy piece of historical fiction. It features a soldier from the defeated Muslim forces of the late-nineteenth century, trying to come to terms with the humiliation suffered at the hands of the British (and their infernal machine guns…). Even if the need for footnotes (and they are most certainly required) interrupts the flow a little, the writing is excellent, and the soldier’s conversation with his sister, interspersed with quotations and poems from the time, draws the reader back to the broken, conquered city, creating a melancholy mood. It’s been a week since I took delivery of the tank, which I bought from a middleman who lives nearby. The deal has worked out beautifully, but the sight of it parked under the neem tree in front of our house did come as a shock to a few of my friends. It hasn’t escaped my notice that most of them haven’t visited since. Whether it’s complete fiction or a clever examination of how nepotism and corruption pervade society, al-Malik’s tale makes for an entertaining, well-constructed start to the collection. This isn’t the only work in The Book of Khartoum with a touch of humour either. Abdel Aziz Baraka Sakin’s ‘The Butcher’s Daughter’ (tr. Raph Cormack) has a country father visit the big city after hearing some disturbing rumours about his daughter. A story which in other hands might have ended in tragedy instead becomes a short piece akin to a Shakespearean comedy. There’s also a light-hearted feel to much of Bushra al-Fadil’s ‘The Story of the Girl Whose Birds Flew Away’ (tr. Max Shmookler), in which a self-proclaimed poet has an eye for Khartoum’s busy streets and a beautiful woman he sees on them, even if the ending is a little more somber (and suspicious…). The success of the writing is not just down to the language used but also to the creative use of structure. Perhaps the best example of this is Isa al-Hilu’s story ‘A Boy Playing with Dolls’ (tr. Marilyn Booth), in which the short scenes, stories within stories, leave the reader unsure as to whether the events described are happening in real life or are being played out by the young protagonist. Because, of course, you’ll die that day, when the hour and minutes spell out the letters of that curse: ‘REJECTED!’ With that word uttered, your spirit will leave your body. How heavy refugees’ corpses are! Your corpse will be a heavy burden for us. With his slightly hazy description of a man looking for a new life, Yak offers a reminder that past troubles have spilled over into the present day (and, sadly, haven’t entirely been settled).